Angles upon angles upon angles. 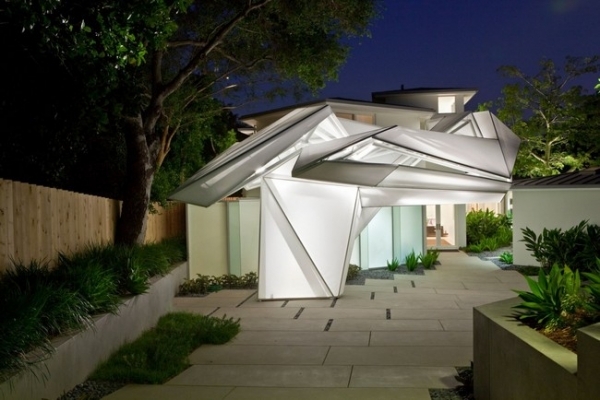 That is what first comes to mind when looking at the geometric design of this home, in Los Angeles, California. The lighted triangles go every which way, pulling and pushing everywhere at once. This geometric design demands attention, inciting every onlooker to inspect and dissect. Colossal windows and a large and in charge backyard area, complete with pool, are just the tip of the iceberg in this treasure chest of a home. 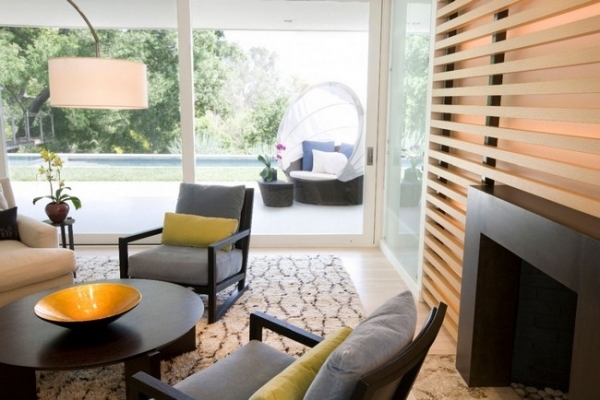 The modern home interior was realized by Rozalynn Woods Interior Design. Rozalynn used natural colors, light hardwoods, and black accents, as the unifying theme throughout the home. 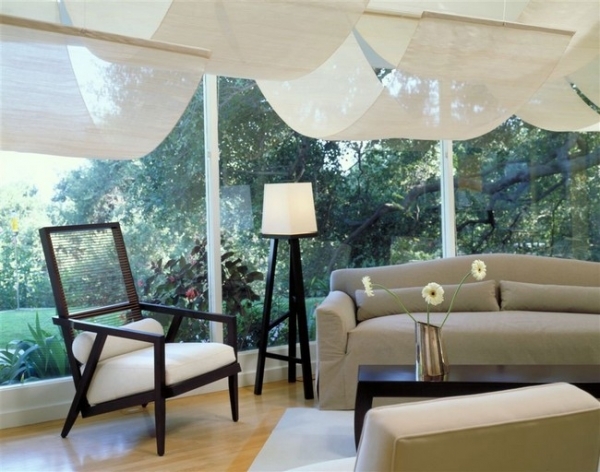 In the lovely living room sits a modern low circular table, surrounded by black chairs with gray cushions. 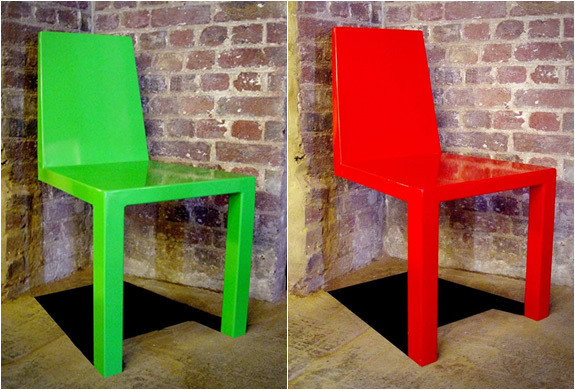 The chairs are wonderfully accented with green-yellow cushions, adding a little color to the room. The hardwood floor is covered by a creme, cozy patterned rug, sectioning off the sitting area. But, the centerpiece of this wonderful living room is the black fireplace. It is surrounded by marvelous horizontal wooden slats. The lines of the wooden slats really enhance the living room, giving it an artful elegance. The kitchen is a sight to be seen. Light pours in the room through lengthy windows and glass doors. 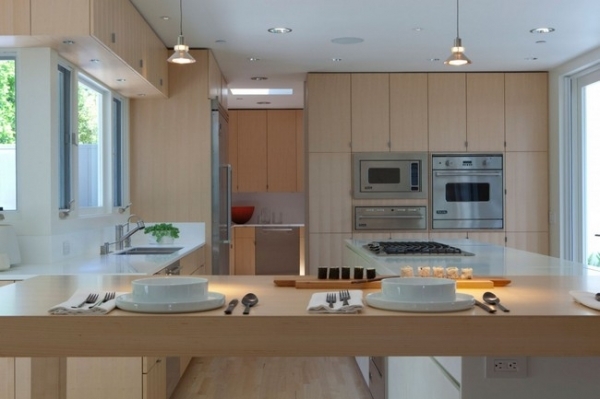 Bright white counter space provides distinction, in this otherwise natural wood kitchen. The modern home interior includes, stainless steel appliances, black and silver barstools, and three identical but individual lights, keeping this kitchen modern and clean. 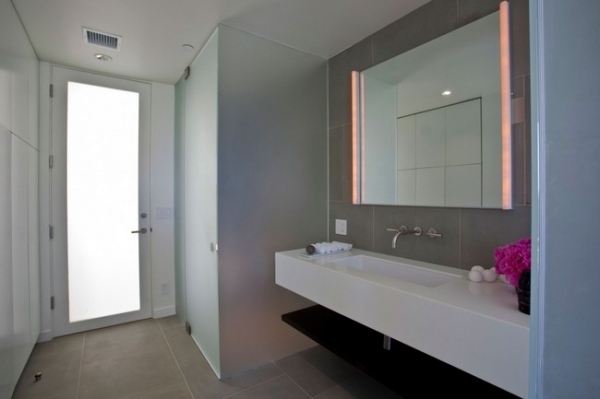 The guest bathroom has silver appliances, a beautiful white rectangular sink, and gray flooring. 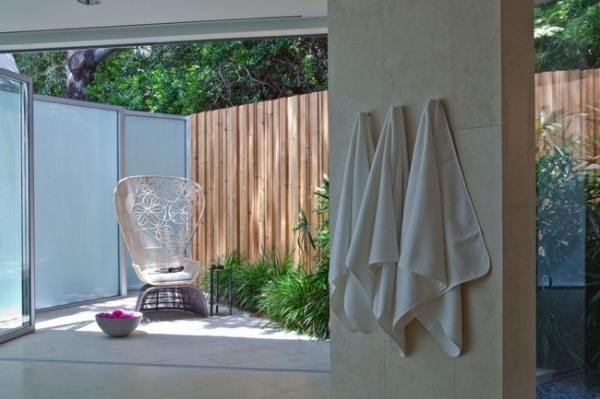 The frosted glass is dazzling, keeping the room cool and spa-like. 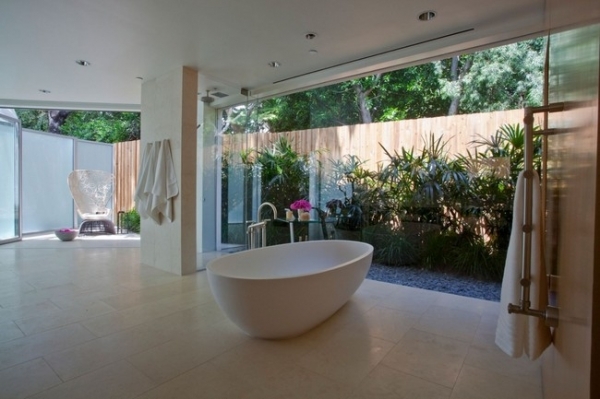 The master bathroom is out of this world. 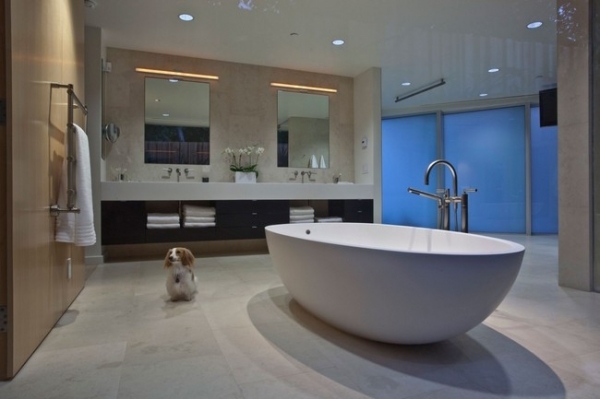 It has silver appliances, a white double sink, neutral flooring, and a large soak tub. 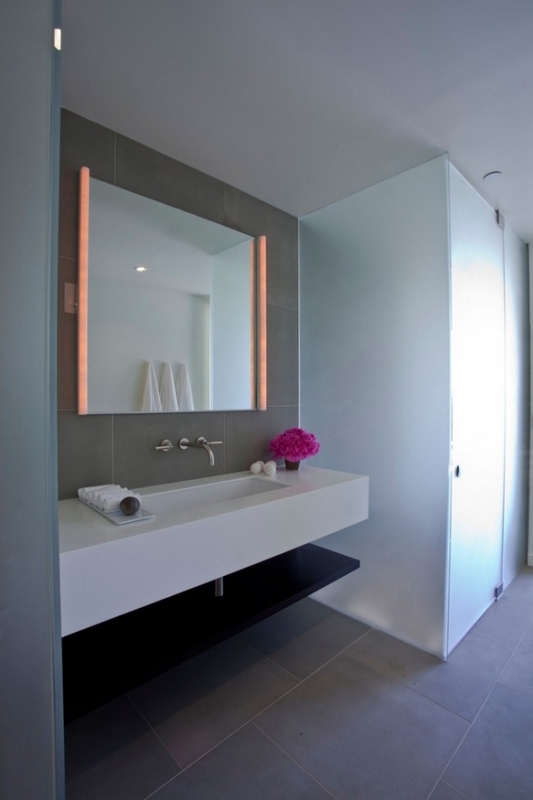 The colors in this room are warm, giving it a more homey atmosphere.This bathroom is fantastically elevated beyond the everyday, by the outside space, and the large floor to ceiling windows. Geometric design and a modern home interior, place this contemporary home and its unique characteristics, in a class all by itself.